This entry was posted on March 31, 2009 at 12:35 AM and is filed under Design Software, Ez-Architect, Home Design Software, landscape design software, Landscape Vision, Mac Design Software, MacDraft, MacDraft Professional, Tips and Tutorials, Windows Design Software. You can follow any responses to this entry through the RSS 2.0 feed. You can leave a response, or trackback from your own site. 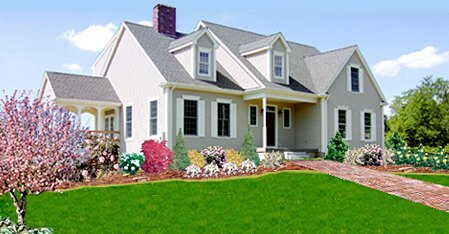 I just finished landscaping some photos with Landscape Vision, and it was great fun! I hope everyone will check out the Landscape Vision video above and see what I mean! Sounds cool. Will it work on my crazy Vista (boo!) machine? Lots of the cheap programs work on XP but not on Vista. Yes! It was designed to work on both XP and Vista. As a matter of fact, if you install Windows XP or Vista on a double-boot Mac, it will work on the Mac too. I know. I tried it. If thift is your game, then Ez-Architect is the way to go. For under twenty bucks you can do great architectural, interiors, and landscape design, accurately, and print out your creations. Hey, that’s cool! I’m glad you are doing this blog. I’m designing an addition to my house, what with the economy in the dumper and all.